Protect the popcorn! « You know… that Blog? The Teen and I had a Mother-Daughter evening out, just the two of us, in celebration (ok, I was celebrating, she wasn’t) her return to high school tomorrow. It’s the Most WONDERFUL Time… of the year!!! Anyway. Because she was away almost the whole summer, she had not yet seen the latest Harry Potter flick, so I sat through it again. I think I enjoyed it more the second time, because I wasn’t expecting anything that wasn’t going to happen. I was a bit disappointed the first time I saw it, because the book read in a more exciting manner than the movie was able to portray. The Teen enjoyed it though, and I enjoyed watching her have “Ah HA!” moments as key points were made clear. On the way out, I fulfilled the Hubby’s only request for our evening out without him: Popcorn. The man is addicted to movie theatre popcorn. The only question was: How to get a very full bag of popcorn home without dumping it inside my vehicle? Ermmm… that reminds me, I need to wash Wee One’s car seat cover. After, we stopped at Montana’s (Wee One calls this place “Hannah Montana’s”) for dinner. 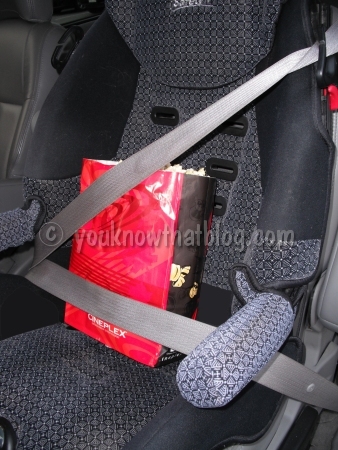 Popcorn baby waited in the car. .-= laurie´s last blog ..WHAT WILL I BE WHEN I GROW UP? =-. .-= cherie de castro´s last blog ..THE GIRLS OF MY CHILDHOOD =-. .-= storyteller at Sacred Ruminations´s last blog ..Tennis Shadows and more … =-. ROFL!!!!!!!!!!!!!!!!!!!!!!!!!!!! That is hilarious! I actually giggled out loud when I saw it! Personally, I COMPLETELY understand your Hubby’s Movie Popcorn obsession. I often just drop in at the theatre to pick up a bag…With Tripple butter of course! :) And as you know..I even went as far as to get my own popcorn cart..with the same brand of popcorn that the Movie Theatre uses..now all I need is a butter melting thingy…Mouahahhah! .-= Doodle Cakes´s last blog ..Camping Cake =-. .-= Mighty M Family´s last blog ..Happy labor day weekend! =-. That’s cute; popcorn baby….LOVE it!! .-= stephanie (bad mom)´s last blog ..big tease =-.